During the PMA show in Las Vegas SanDisk introduced the SanDisk Extreme and SanDisk Ultra II versions of Memory Stick PRO, a new line of premium, high-performance digital film cards targeted at advanced and professional photographers. 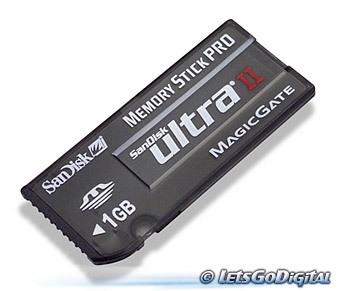 Similar to the Extreme and Ultra II CompactFlash and SD product families introduced earlier by SanDisk, the two new Memory Stick PRO cards deliver a minimum write speed of 9 megabytes (MB) per second and minimum read speed of 10MB a second, making them the fastest Memory Stick PRO cards in the world. SanDisk Extreme Memory Stick PRO products, which have numerous features including the ability to operate in extremely hot or cold environments, will start shipping at the end of this month and be available in capacities of 256, 512MB and 1 gigabyte (GB). The new cards will be sold through photo retail channels across North America. The new cards feature the widest operating temperature range among flash memory cards (-13F to +185F), a significant asset to many professional photographers who sometimes must shoot pictures in boiling desert conditions or frigid locales. Each SanDisk Extreme card includes a protective carrying case and RescuePRO software to allow photographers to easily recover accidentally deleted images, lost digital images or data. RescuePRO is compatible with both Windows and Mac and requires no driver download or special card reader. In addition, every SanDisk Extreme owner gains access to a dedicated, priority 1-800 tech support call line. SanDisk Ultra II Memory Stick PRO: SanDisk Ultra II Memory Stick PRO cards are available in consumer electronics stores and other retail channels. The cards are fully compatible and interchangeable with all Memory Stick PRO digital cameras, camcorders, card readers and adapters. According to Tanya Chuang, retail product marketing manager for SanDisk's Extreme and Ultra II products, "With the SanDisk Ultra II Memory Stick PRO cards, most consumers will notice the fast write speeds which will allow them to view images more quickly on their camera LCD screens after taking pictures. And the fast read speeds let them upload images to their computer much faster." The cards, which will start shipping at the end of this month, will be available in capacities of 256, 512MB and 1GB. The SanDisk Extreme and Ultra II product line now consists of three card formats: CompactFlash, Memory Stick PRO and SD. These high performance cards use SanDisk's NAND flash technology and highlight the company's ongoing commitment to continued improvements in speed, capacity, reliability and features for storage cards.